New York - The E63 AMG is now even more powerful and efficient. As part of the "AMG Performance 2015" model strategy, the high-performance E-Class now features the new 5.5-liter V8 biturbo engine. Familiar from the 2012 CLS63 AMG this new engine can produce either 518 hp or 550 hp, together with an impressive reduction in fuel consumption - 22 percent less based on the European driving cycle. Also responsible for improved fuel economy is the newly developed electromechanical AMG speed-sensitive sports steering system which only draws power during steering wheel movements. The 2012MY E63 AMG goes on-sale in the U.S. this Fall. This eight-cylinder powerhouse, designated internally as the M157, boasts a combination of innovative high-tech components such as spray-guided direct gasoline injection with piezo injectors, a full aluminum crankcase, four-valve technology with camshaft adjustment, air/water intercooling, generator management and an Eco Stop/Start system. With a displacement of 5,461 cc the eight-cylinder engine develops a peak output of 518 hp and torque of 516 lb-ft. In conjunction with the optional AMG Performance Package, these figures increase to 550 hp and 590 lb-ft. Both variants of the E63 AMG achieve exceptional performance: acceleration from zero to 60 mph takes 4.4 and 4.3 seconds respectively and the top speed is 155 mph or 186 mph with the AMG Performance Package (electronically limited). The improvements in output and torque that come with the AMG Performance Package can be attributed primarily to an increase in the maximum boost pressure from 14.5 to 18.8 psi. Visible differentiation is provided by a carbon fiber engine cover, AMG Performance steering wheel with black Alcantara side grips, red-painted brake calipers and a carbon fiber trunk lid spoiler. The AMG SPEEDSHIFT MCT 7-speed sports transmission also plays a major role in the car's exemplary consumption figures. In place of a conventional torque converter, the MCT uses a compact wet start-up clutch. The 2012 E63 AMG also features a ECO Stop/Start function which is active in the Controlled Efficiency ("C") transmission mode and switches the eight-cylinder engine off when the vehicle comes to a stop. The ECO Stop/Start function can be activated or deactivated using the ECO button on the center console. When in transmission mode "C", the vehicle will always start-off in second gear. The system will also shift earlier and avoid high engine speeds. The demand-driven fuel pump and generator use braking energy during deceleration to further add to fuel economy. 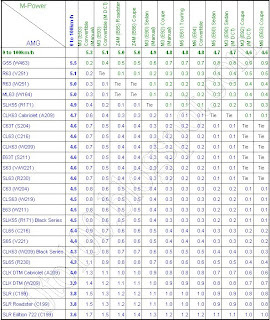 Even with these improvements performance is not compromised thanks to transmission modes "S" (Sport), "S+" (Sport plus) and "M" (Manual) which enhance the car's agility with shorter response times, higher engine speeds and sharper gear changes to harness the full potential of the new AMG V8 biturbo engine. In all three transmission modes, not only is the ECO Stop/Start system deactivated but the engine management system partially suppresses the cylinders at full load. This carefully managed interruption to ignition and injection results in faster gear changes and an exhilarating exhaust note - all aided by automatic rev-matching during shifts. The 2012 E63 AMG features the AMG RIDE CONTROL sports suspension with a specially designed front axle: the track has been widened by 2.2 inches and includes independent wheel carriers for increased negative camber at the front to improve grip during performance driving. Further features include steel suspension struts on the front axle and air suspension struts on the rear axle, with an automatic level control system and an electronically controlled damping system, which automatically adjusts the damping characteristics depending on driving conditions and reduces body roll. All this combines to provide lightningquick adjustment between optimum driving comfort and the best possible agility. The driver can switch between the three suspension modes of "Comfort", "Sport" and "Sport plus" at the touch of a button. The 2012 E63 AMG is also features a new electromechanical AMG speedsensitive sports steering system with a more direct ratio of 14:1 and variable power assistance that adapts according to the suspension mode. The new steering provides extremely agile handling through bends while also helping to reduce fuel consumption since the power assistance system only draws power when the vehicle is actually being steered. In addition to the 3-stage ESP® system with Sport mode, the E63 AMG features the AMG high-performance braking system with two-piece discs at the front. An even more powerful, 40 percent lighter AMG ceramic high-performance two-piece braking system is available as a special order option. Optimum grip comes courtesy of the new 19-inch AMG 10-spoke wheels with 255/35 R19 tires on the front and 285/30 R19 at the rear. The "flowforming" production process already used with the SLS AMG and the CLS63 AMG optimizes durability, while also reducing weight by up to 1.76 lb per wheel. Externally, the E63 AMG with the new M157 engine is identifiable by its new light-alloy wheels and the "V8 BITURBO" lettering on its distinctive, wider front fenders. Further unique details include AMG bodystyling with a specific design for the front and rear along with AMG rocker panels and an AMG sports exhaust system with two chrome-plated twin tailpipes. A striking feature of the high-quality, exquisitely crafted interior is the new AMG Performance steering wheel in a three-spoke design. The rim of this wheel, as in the 2012 CLS63 AMG, is flattened at both top and bottom to facilitate even better control of the vehicle. Aluminum shift paddles, the perforated leather in the grip areas and the three-dimensional design of the airbag cover with its "Silver Shadow" metallic trim element complement the new E-SELECT shift lever with embossed AMG badge. Like the CLS63 AMG, the instrument cluster of the 2012 E63 AMG features a three-dimensional full-color TFT display in the center of the speedometer. The driver is welcomed by the AMG logo within the display upon opening the door. Numerous driver assistance systems in the 2012 E63 AMG help to avoid traffic accidents or mitigate their severity, such as Active Blind Spot Assist and Active Lane Keeping Assist. Active Blind Spot Assist warns the driver if the short-range radar sensors detect a risk of collision should the vehicle change lanes. If the driver ignores these warnings and comes dangerously close to the vehicle in the next lane, Active Blind Spot Assist will intervene by applying braking force to the rear wheel on the opposite side of the vehicle, controlled through the 3-stage ESP® system, a yaw movement is created which corrects the car's path. Active Lane Keeping Assist is also linked to the 3-stage ESP® and activates when the driver inadvertently drifts over a solid line to the right or left of a lane. In this case, Active Lane Keeping Assist brakes the opposite rear wheel and prevents the vehicle from crossing the line. A display on the instrument cluster warns the driver at the same time. If broken lane markings are crossed, the system controls an electric pulse generator in the steering wheel which generates vibrations for a short time - a discreet but effective cue to countersteer immediately. Before the braking system intervenes, the steering wheel always vibrates to provide a warning. 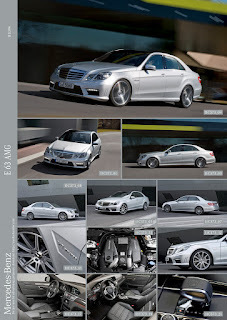 The 2012 E63 AMG with the new AMG 5.5-liter V8 biturbo engine goes on-sale in the U.S. this Fall.